Divide into 4 to 6 equal parts and make into patties. You can cook these several ways: broiler, grill, oven or skillet. Cook over medium heat for 5-7 minutes on each side. Put a slice of Pepper jack Cheese on just 1-2 minutes prior to completion so it will melt nicely. This looks really good – a bit of a twist on the standard burger. Might just have to give this a try. The burger looks stunning. The recipe sounds simple and delicious. I will make this in the afternoon when it’s rain. Thanks for sharing. Wow, this sounds awesome. I’ll admit to being a little skeptical of the coconut (not sure I want a sweet flavor literally in my burger) but that sauce sounds incredible. And it’s made with turkey – this just gets better and better. The list of ingredients do combine to make me say this is a winner and I will bookmark it. This really flavors the turkey! This sounds amazing!! Reading the ingredients sounds so interesting. Peanut Butter? oh yes…I have to try this. Thanks for sharing. The peanut butter is what is getting me. I have done Indian style burgers before, but nothing with PB. Worth a try for sure! I swear, I always gain 5 pounds when I come read your posts. The burgers look so scrumptious that I can’t stop drooling. This is definitely another keeper. I love June being burger month! As soon as I saw the title of this post, I pretty much rushed right over. Curry, coconut and peanut butter in a burger? It sounds just crazy enough to be delicious! Wow! That sounds amazing. We try to “spice up” burgers regularly–this sounds like a great addition to the menu! I had to bookmark this right away. 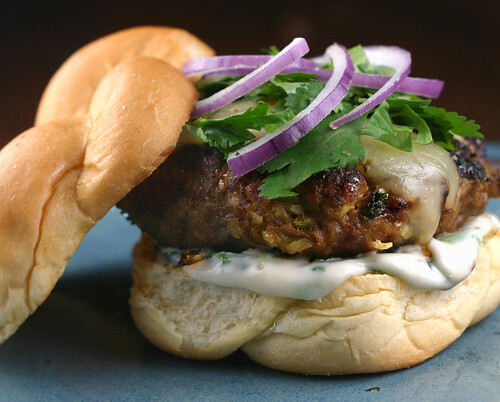 I’ve never made a curry burger before but this sounds sooo good! I bet my husband will love this too. Thanks so much for sharing this! Very interesting that you added coconut to the burger… I’m sure it added great flavor to the whole thing! curry burger. I like the ring to it. Oh, hello! Nice way to jazz up the grill. Wow! It sounded good when I read the title, but the ingredient list is over the top! How unique. I bet it tastes awesome! OMG!!! This burger is extremely good looking. The taste must be outstanding!!!!! I’m making these for lunch today. They’re on the grill as I post! Oh shoot, and I cancelled going to your house for lunch today….big mistake! This burger sounds delicious! Nice picture, too! They were delicious! I’ll be making them again soon. So glad you liked them! So glad you could eat them! OH MY! This looks delicious… I’m actually wiping the drool from my chin as I type this! YUM! with peanut butter? – crazy good!!! This burger was remarkably tasty! My mother hates coconut, my father curry; and I’m not an onion fan so we were shocked when everyone adored this blend of ingredients. The sauce truly multiplies the fantastic combination. Hats off to Foodo for another exciting installment! Thank you Grubby! Your writing style is lovely, as is your singing voice! Sometimes it’s hard to please everyone: JP is not a curry fan, I do not like coconut, Tess is a beef girl, and Manny has never cooked a homemade burger. The solution? The Curry Burger! JP, Tess, Manny & I made Curry Burgers last night. It was very tasty!!! The curry & cilantro was such a unique blend of flavors. Mary & John, you pleased everyone with this burger!! *I see Tess agrees too!! I’m surprised you even made it, since everyone had something they didn’t like in it. WAY TO GO for trying new things! The world could learn from that! Curry is a favorite…Fantastic burger! Absolutely LOVE your blog. I’m getting so inspired just by looking at all these amazing burgers. I just had a burger throwdown an came here for inspiration. I made the Berkely Burgers from BBC – AMAZING! I wanted to try and make these but was wondering if you use sweetened or unsweetened coconut? Thanks. Either will work – I like the sweetened myself. Your burger throw-down sounded like a LOT of fun! This burger was fantastic! Tried it this evening, literally digesting and both my husband and I agree- Fabulous! Woo Hoo!! Thanks for the feedback! Outstanding logo. Funny. Photo is good enough to eat. Cobbling together a recipe. I’ll take your pepper flakes. Ever try this with ground lamb? I’m not a lamb fan – but if you do try it – come back and let us know how it worked.